Published Aug 9, 2017 by Addison-Wesley Professional. Part of the LiveLessons series. 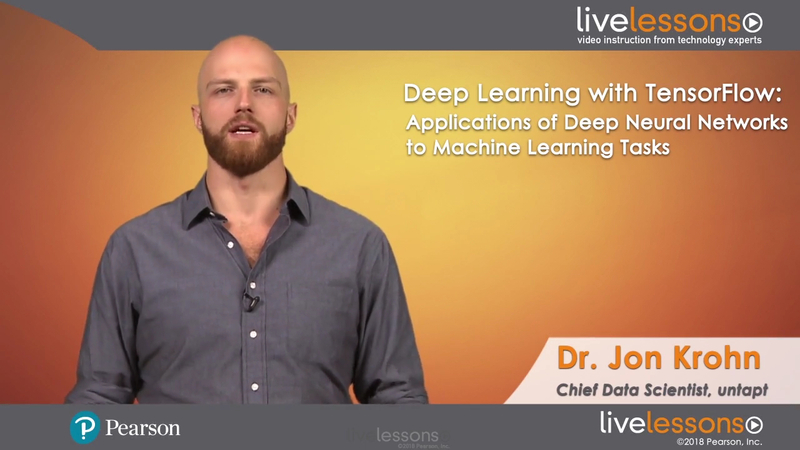 The first lesson starts off by giving the viewer an overview of deep learning, its roots in artificial neural networks, and the breadth of transformative applications it produces. Jon also goes over how to run the code examples provided throughout the LiveLessons, and then he builds an introductory neural network with you. The lesson begins with a discussion of the main families of deep neural networks and their applications. The heart of the lesson is a high-level overview of the essential theory that underlies deep learning. To bring this theory to life, Jon shows you deep learning in action via a web application called the TensorFlow Playground. He introduces the archetypal deep learning data sets, and then you build a deep neural network together to tackle a classic machine vision problem. The previous lesson covered the principal foundations of deep learning and enabled you to construct a deep network. This lesson builds upon those theoretical foundations to build more effective deep nets. You immediately take that effectiveness a big step further by gaining an understanding of convolutional layers and how they have can be stacked to solve increasingly complex problems with larger data sets. In order to make sense of the outputs from these sophisticated models, the TensorBoard result-visualization tool is added to your arsenal at the end of the lesson. Up to this point you use the high-level deep learning API Keras to build your models. In this lesson, the leading Deep Learning libraries are compared, and then you get down to business with TensorFlow, the open-source library doing the heavy neural network-lifting underneath Keras and, in Jon’s opinion, clearly the best choice from the options available. Given this, the second half of the lesson is dedicated to building your own deep learning models in TensorFlow. In Lesson 5 you delve deeper into TensorFlow, leveraging it to improve the performance of your deep learning models, including by tuning model hyperparameters. The lesson concludes by discussing how to build your own deep learning project as well as outlining resources for further self-study.